Okay, so I’m afraid to ski down a mountain – incurable vertigo – but challenge me to dive under the ice of a frozen lake and I’m all ready to take the plunge. The Lac de Tignes is the place to be for those who want to try ice diving and both Jempi and I were eager to give this cool sport a try. The setting: a hole in the ice and a small cabin on the lake. Our ‘dressing room’ was a small cabin on the frozen lake. With four people inside (two instructors from Evolution 2 and Jempi & me) it felt a bit crowded, especially when we had to put on a special dry suit for ice conditions, over our clothes and that was easier said than done: there was some pulling and struggling going on, and once fitted it looked like I gained 20 kilo’s in 10 minutes. We had the best instructors you could image. They were both professional and funny, a good thing to calm us down a bit because we have to admit: we were a bit (a lot!) nervous. After a short briefing on how to breathe (only through the mouth), how to swim(vertical), how deep we were diving (about three meters below the ice) and what to do if we panicked (duh, don’t panic!) we were ready to go. I was the first to hit the water and surprise: it didn’t really feel that cold at all. That is: until some water slipped into my glove and ow boy freaking cold! I had to go up again, get new gloves and go into the ice for a second attempt. The ‘encounter’ with the ice-cold water made me a bit nervous and I found it harder to swim vertically. My instructor however grabbed me firmly with his legs and off we went. Not exactly a position to try with every stranger, but given the circumstances it was a genius idea. Meanwhile Jempi was ready for his ice dive and his first attempt was certainly better than mine: like a sea-lion already runs better than mine: he slipped into the water like a sea-lion and there he went, straight under the ice, no hesitation. It took forever – or so it seemed – before he and his companion come back up again. When he finally washed up he was super excited: apparently the dive went so good his instructor had decided to stay a bit longer under the ice, making the experience even more intense. Is there anything to see under the ice? Don’t worry, there’s a lot to see! On clear days, when the sun is shines over the ice, you can admire spectacular rainbow colors and light circles. 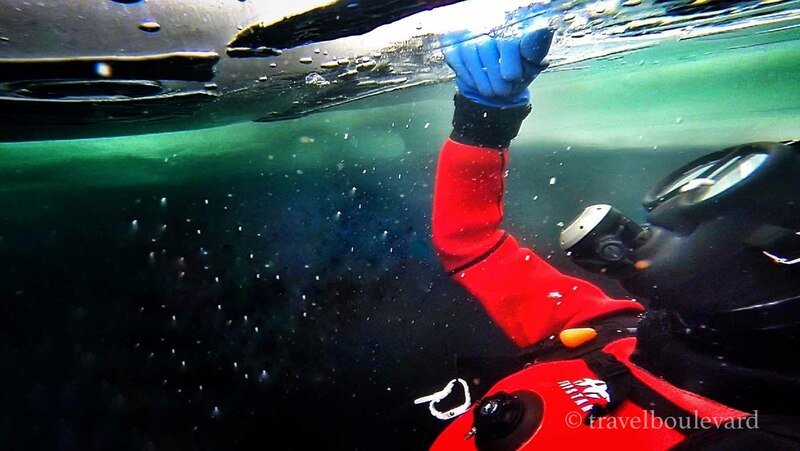 During our ice dive however it was cloudy, but that didn’t make the experience less impressive: the dancing air bubbles, the peaceful silence under the ice, the moving in slow motion… it was truly unforgettable! Good to know: you don’t need any dive experience to go ice diving in Tignes; there are very good and experienced divers to guide you under the ice, it’s all very safe. And if you’re hooked on it and looking for more: it’s also possible to go ice diving at night, good for a totally different experience. Check out Evolution 2 Tignes for more information & tignes.net. Brrrr!!! I think I’d feel a bit claustrophobic with the ice above me, instead of just the sky. Respect! 🙂 Well, it was indeed a bit claustrophobic, but it was so beautiful under the ice! I soon forgot about the ice above me, so all went well (and I’m usually not a very brave person :)). This is so cool! Nothing that I have read much about. After begin in the water a little longer, does it get really cold? I definitely want to try this now! Thank you for adding this to my bucket list!